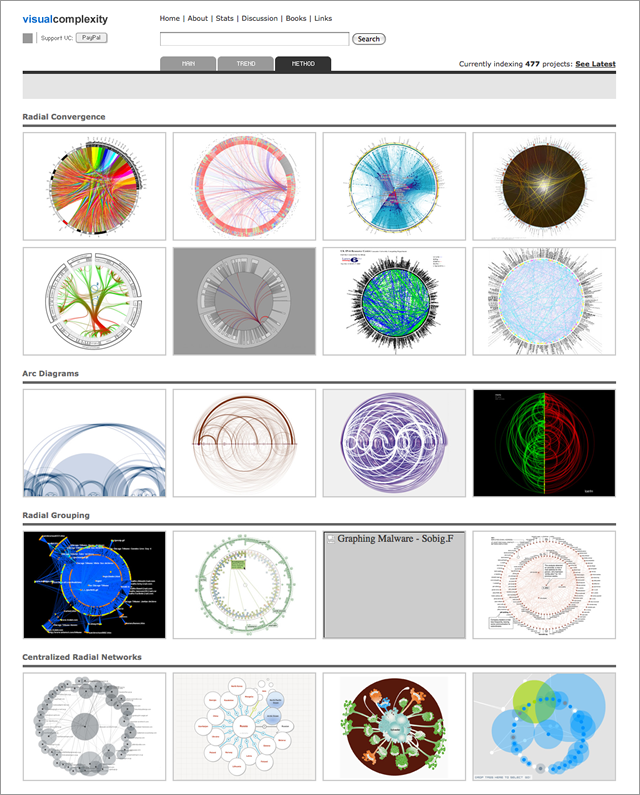 As you can see from the image above, those eight radial convergence projects were amongst the first to be indexed in VC. Interestingly enough, three of them, respectively AS Internet Graph (2002), GNOM (2005), and Circos (2005) are amongst my favorites to this day. Although I had started talking about this method in conferences like MeshForum (San Francisco) and reboot 9.0 (Copenhagen, Denmark) it remained nameless for a while. The label came out from a need to classify this and other layout types within the growing collection of projects. Since the model is essentially defined by a radial ordering of items converging with each other, the title radial convergence became an intuitive fit. However, it was hard to predict the method would take off as much as it did. Within the last three years it has become immensely popular, and it seems that with every batch of new projects added to VC there’s always one exhibiting this favored layout. There are probably many reasons that can explain this popularity. First, it’s a simple execution. It’s probably one of the easiest and fastest ways to trial or visually convey a relational database. Second, it’s remarkably alluring. Humans have a widely known and documented obsession with the circle and many of its iconographic qualities that have been revered through millennia, such as divinity, perfection, unity, or closure. Third, if we add to the previous reasons the growing availability of data, number of visualization enthusiasts, and easy-to-use software, then we have the perfect conditions for growth, multiplication, and increasing popularity. Currently there are 33 projects under radial convergence in VC, mapping a variety of subjects, from IP addresses to Facebook friends. Here’s a screenshot of all of them, as of January 24, 2011. Could you provide a few suggestions for programs or software to use to generate radial convergence plots. Thanks.